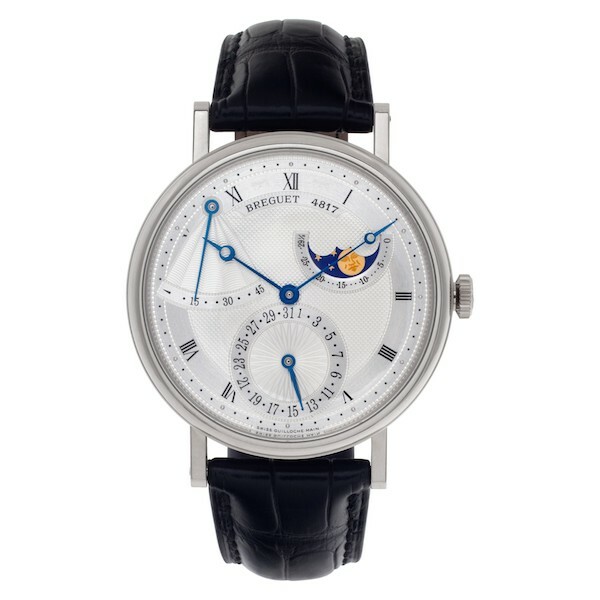 When it comes to classical looking timepieces, it does not get more traditional than white metal and blue hands. Watchmakers have been relying on this elegant combination for centuries. Not only do blued steel hands have the benefit of beauty, but subjecting the steel to high heat until they turn into the desired color also has anti-corrosion effects. The blue color of the steel is actually an oxide layer on the surface of the metal that is the result of a specific temperature; this is a time-consuming and complex process and a hallmark of quality. 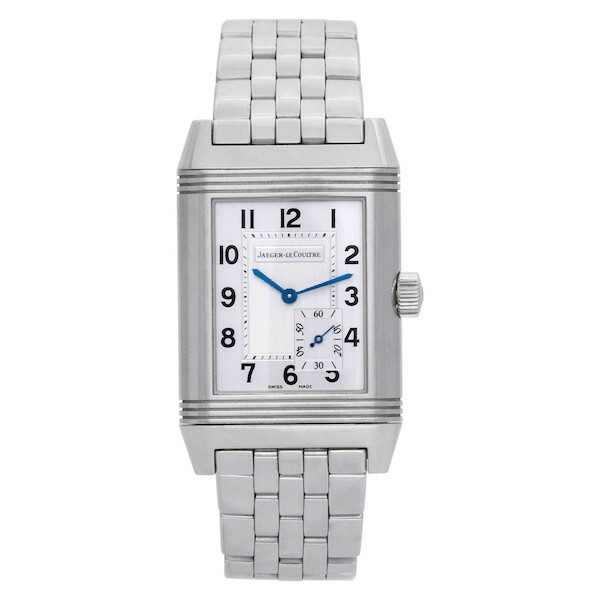 To emphasize the gorgeous hue, blued steel hands are often placed on a white or silver dial. Here’s a roundup of some of our favorite high-end timepieces that flaunt the classic white metal case and blue watch hands combo. A discussion of blue hands on a watch inevitably brings up the storied Breguet name. In fact, the so-called Breguet hands, invented in 1783 by A.L. Breguet himself and characterized by the hollow moon tips, are more often than not made from blued steel. Take for example this handsome Breguet Classique Power Reserve 7137 timepiece. At the center of the guilloché silver dial sit the famed blued steel Breguet hands, accompanied by two other blue hands to on the date display and the power reserve indicator. The moon phase display also adds another pop of color to the face of the watch, while the sapphire caseback gives a view of the self-wining movement powering the Breguet watch. Housing the dial is an 18k white gold 39 mm case, which completes the classic white metal and blue hands style perfectly. As the brand’s flagship dress watch, most Patek Philippe Calatrava models have simple time-only dials with minimal adornment. 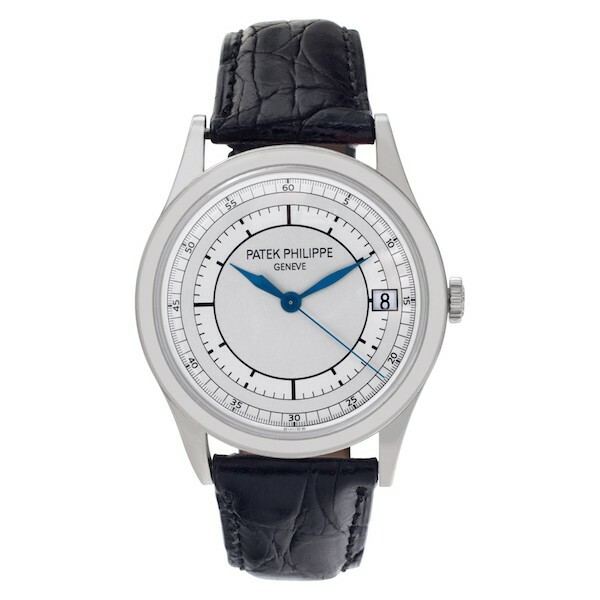 However, there are some models, such as this stunning Patek Philippe Calatrava 5296G, that flaunt a little extra flair. Encased within the 18k white gold 38 mm round case is a two-tone sector dial in silver and gray. And in striking contrast to the dial colorway are the blued dauphine-shaped hands in the middle. In addition to the time, the Patek Philippe Calatrava 5296G also features a date window at 3 o’clock. Flip the watch around and you’ll see the in-house Caliber 324 automatic movement, complete with the signature yellow gold rotor. Moving away from white gold to another popular white metal used to make luxury watches, we now turn our attention to a steel model. If you haven’t already, meet the Jaeger-LeCoultre Reverso Grande Reserve 240.8.14 with its iconic swivel-style rectangular case. On the face of this JLC watch, we see a silvered dial with a guilloché center, which is punctuated with a pair of blue hands at the center for the hours and minutes along with a rectangular subdial, also with blue hands, to indicate the running seconds. Swivel the case onto itself to bring the caseback up front and to tuck the dial away, and a power reserve indicator reveals itself. The manual-wound Jaeger-LeCoultre Reverso Grande Reserve 240.8.14 boasts an eight-day power reserve, which is tracked via a jumping reserve indicator. For an ultra-lavish take on the classic white metal case and blue watch hands mix, there’s the Cartier Ballon Bleu Automatic WE9009Z3. 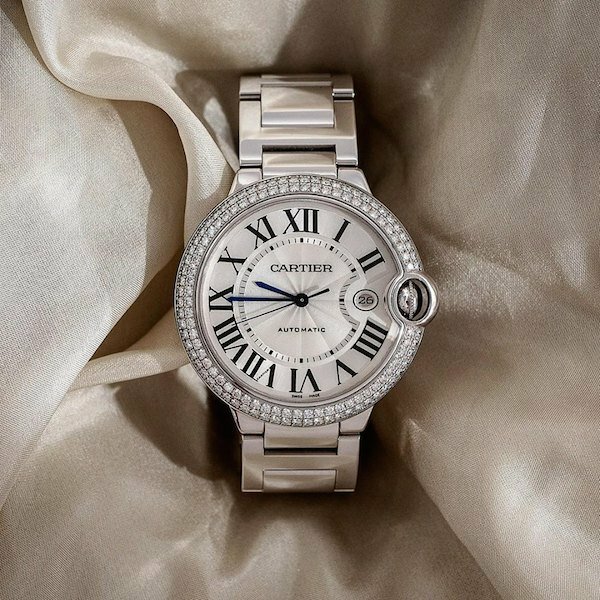 This opulent men’s Cartier watch sports a 42 mm 18k white gold bulbous case and matching white gold link bracelet, in addition to a double row of diamonds on the bezel. Blue sword-shaped hands are a familiar design detail for the house of Cartier, as is the blue stone set into the winding crown. Like most Cartier watches, this diamond Ballon Bleu features black Roman numerals on the dial, except at 3 o’clock where we see a date window instead. 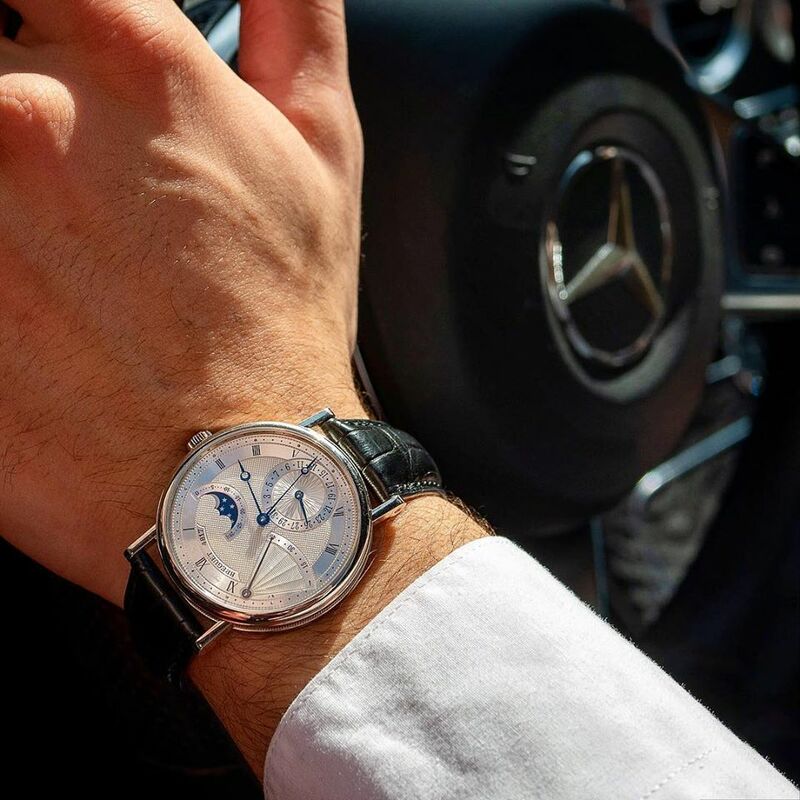 If you’re looking to add a fine timepiece with a white metal case and blue watch hands to your collection, you are certainly spoilt for choice. As one of the classic watch styles out there that has lasted for centuries, this look is the very essence of timeless style. Motorsport Madness: Six Car Inspired Watches Luxury cars and auto racing have always been a source of inspiration for watches.